If you were paying attention to the start of Apple's developer conference on Monday, you'll have noticed that the tech giant launched a brand new product with an odd-sounding name: the HomePod. Yes, it's the long-rumoured Siri speaker we've all been waiting for. Or have we? With the Amazon Echo nearly three years old and the Google Home now available in the US and the UK as well, Apple has some stiff competition in the smart speaker space. Here we pit the three devices against each other in all the key categories. Apple has been making much of the audio capabilities of its brand new HomePod, saying that it's powerful enough to fill a whole room with rich sound. The speaker has a seven-tweeter array, a custom-built subwoofer, echo cancellation and real-time acoustic modelling to adjust to the environment it finds itself in. Of course we have to take Apple's word for all this - it's not actually out until December. It's probably fair to say Google and Amazon are less interested in audio performance, though their speakers still sound decent. The Google Home has what it calls a high excursion speaker with a 2-inch driver and two 2-inch passive radiators: we've used one and it sounds good enough to enjoy your music on. Not as good as a Sonos speaker, but not as bad as a cheap Bluetooth speaker either. As for the Amazon Echo, the full-sized version of the device is fitted with a 2.5-inch tweeter, and a 2-inch subwoofer. Again, we've heard the audio performance of the Echo for ourselves, and we'd put it just slightly below the Google Home - it'll do for a party or some casual listening but serious music enthusiasts are going to be left wanting. You do have the option of the cheaper Echo Dot, of course, which you can plug into any speaker system you like. You may already be familiar with one or more of Siri, Google Assistant and Alexa, the smart assistants that power these speakers. Siri is the oldest and the most polished, although very much locked to Apple's platform - if you've got an iPhone, iPad or macOS computer, you're probably already good friends with Siri. It has a wide range of talents, and usually recognises what you're trying to say well enough. Google Assistant probably has the edge over Siri when it comes to understanding what you're getting at and what your requests mean, thanks to its superior natural language processing. It's not quite as comprehensive as Siri in what it can actually do though - at least not yet. Google is still in the process of rolling it out to Android and adding extra capabilities, but it benefits from all the data its maker can collect on you, which means a more personalised experience (as well as more privacy worries). Alexa - just like the Amazon website - is sprawling and a little untidy around the edges. The number of skills it has run into the tens of thousands, but just how many of them are actually useful is another matter. Plus, Alexa has the disadvantage of not being able to collect information about you from either Android or iOS. There's no doubt Alexa is a very capable assistant with a lot of strings to its bow - and voice recognition has evolved to be very good - but the assistants from Apple and Google feel more rounded, thanks to their being in more places. If you're streaming music to a speaker, you'll want to know about the compatible services. The HomePod, surprise surprise, only works with Apple Music (and AirPlay), whereas the Google Home supports Google Play Music and Spotify and the Amazon Echo supports Amazon Prime Music and Spotify. The Echo and Google Home also work via Bluetooth, so you can stream audio from virtually any app, and Google's device doubles as a casting device too, which means audio can be piped from any app with Google Cast support. Both the Google Home and the HomePod have a sleeker aesthetic design, though on the other hand Alexa is available in three different speakers: the Echo, the Echo Dot, and the portable Amazon Tap. The Google Home has decent integration with Chromecast devices for putting Netflix or YouTube up on the big screen, while the HomePod is expected to play nicely with HomeKit. The speakers from both Amazon and Google support a growing number of third-party smart home devices too. As for multi-room support, this is something the HomePod (via AirPlay) and the Google Home (via Google Cast) can do, but the Amazon Echo can't - although it's expected to add the capability soon. Another advantage the Google Home has for now is the ability to recognise multiple users, so more than one person can use the speaker. The Echo can support multiple users as well, but you need to manually switch accounts by name, at least for now - the speaker can't identify people from their voices. It's hard to say without hearing it for ourselves, but from first impressions it seems that Apple's new HomePod is going to be the best-sounding speaker yet. You're also going to have to pay a price for that quality - it retails for $349 (UK price to be announced, but it'll probably be close to a straight dollar-to-pound conversion). The Google Home, meanwhile, could reasonably claim to have the best digital assistant inside. Google is making huge strides forward in AI and natural language understanding, and of course knows more about you than Apple or Amazon, which helps with personalisation. The device costs £129 or $129, a lot less than the HomePod. Then there's the Amazon Echo, which is ideal if you're a heavy Amazon user - Prime packages, Prime Music, and so on. It also has the most add-ons and the most capabilities in terms of skills, though it lacks the all-around personalisation that Google Assistant and Siri can offer. The full-sized Echo costs £149.99 or $179.99, with the Dot at £49.99/$49.99 and the Tap at $129.99 (US only). We should also mention the recently unveiled Amazon Echo Show ($229.99, US only), with all the goodness of the Echo plus a speaker. There's a lot of overlap with these devices and we'll get a more detailed picture when the HomePod actually launches, but for now it seems Apple is focusing on the audio quality above all else - and charging a significant sum for it. 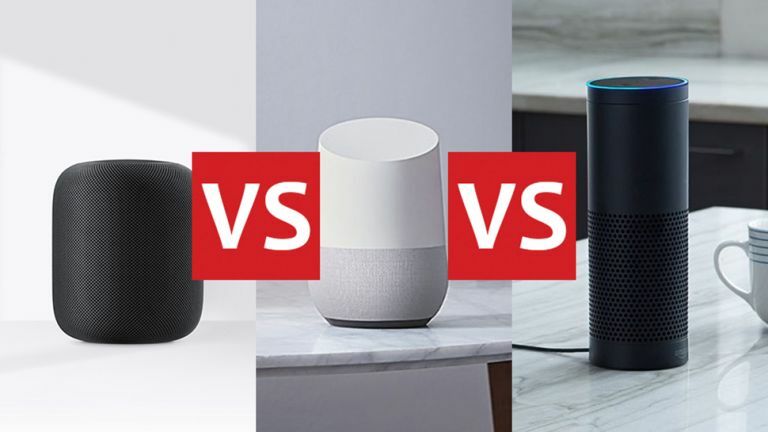 Which speaker is best for you really comes down to which company's services you use the most - Apple, Google or Amazon - and that's the case for more and more devices now.